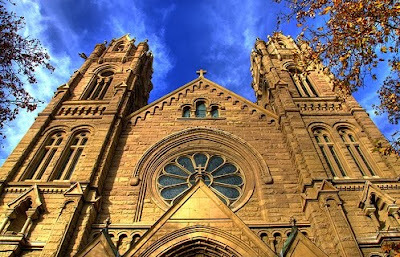 Built as the seat of a 10,000-member local church in the heart of Mormon Country, today sees the 100th anniversary of one of Stateside Catholicism's most impressive hometown hubs: Salt Lake City's Cathedral of the Madeleine. Dedicated on Assumption Day 1909 by the nation's senior prelate of the period, the Spanish Gothic wonder has been celebrated in a big way in the run-up to today's centenary. As the local papers both led their weekend editions with special packages on the church's contribution to the LDS-heavy area, last Sunday's kickoff of the yearlong observance's final lap drew the entire First Presidency of Utah's dominant faith (long a faithful friend to the cathedral and diocese alike), and this weekend's close will be presided over by the CDF prefect Cardinal William Levada, the Salt Lake church's metropolitan during his decade as archbishop of San Francisco before becoming the Vatican's highest-ranking American in history. From its humble roots, the statewide diocese has seen its Catholic population explode over recent decades to within striking distance of 300,000. Home to one of the few European-style cathedral choir schools on these shores and an exceptional social-service ministry, the Madeleine's embrace has expanded in recent years to welcome the significant influx of Hispanic Catholics whose arrival has, as in many other US dioceses, led Salt Lake's boom in numbers, bringing with it a dramatic shift in the feel and priorities of its ecclesial life. 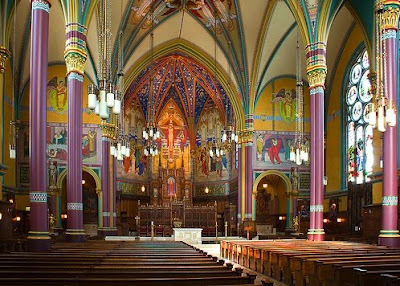 By the looks of it, today's 2pm liturgy for the centennial won't be streamed via the local Intermountain Catholic's webfeed... but for a look (and a listen) at the Madeleine in all its splendor, a host of prior Masses are available on-demand. Speaking of the booming South and West, another milestone was recently celebrated as the diocese of Fort Worth opened its 40th anniversary observances last weekend with a Mass at the city's Convention Center. Carved from Dallas in 1969, the North Texas church has grown from a membership of 65,000 at its founding to 560,000 today.